3D height data can be achieved by directly reading the sample and components height to analyse assembly conditions. 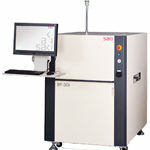 Effective in detecting failures in microchips with small pads and parts having bottom electrodes. Height measurement range is up to 20mm by active projection technology. Sample surface can be measured from 4 directions without dead angle.